PLACE the (frozen) raspberries along with a large handful of sage leaves into your food processor or blender. Blend until a nice and smooth mixture forms. Add yogurt and powdered sugar, then blend again. SCOOP the mixture into your ice cream maker and let it freeze according to instructions. The ice should be evenly frozen all over. Depending on your ice cream maker, this process usually takes up from 30 to 40 minutes. TRANSFER the ice cream to a container, seal and place it in your freezer. PRE-HEAT your oven to a temperature of 175 degrees celsius or 347 degrees fahrenheit. WASH, remove the pit and slice each peach into quarters. CUT each quarter again so you’ll end up with eight pieces. Divide these pieces over the baking tray. Split the vanilla bean lengthwise into halves. SCRAPE these pod halves by running the un-sharpened side of your chef’s knife down the length of each pod, use firm but steady pressure. 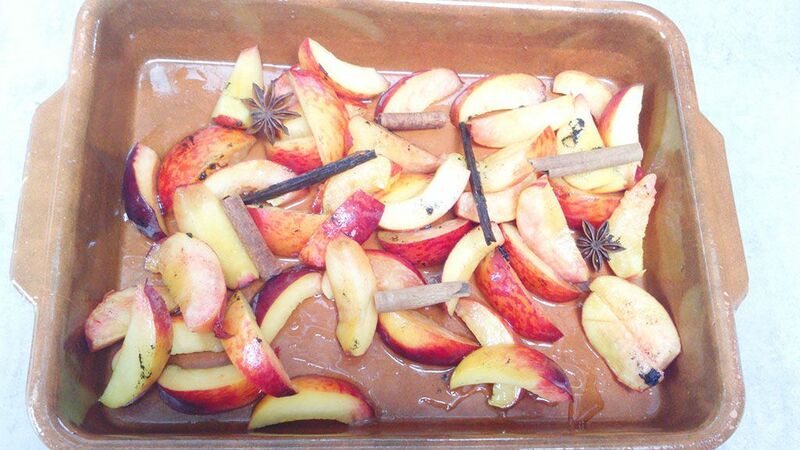 Divide the vanilla marrow and vanilla pod along with the cinnamon sticks and star anise over the peaches. DRIZZLE with regular honey and bake for 10 minutes, or until the peaches are warm. 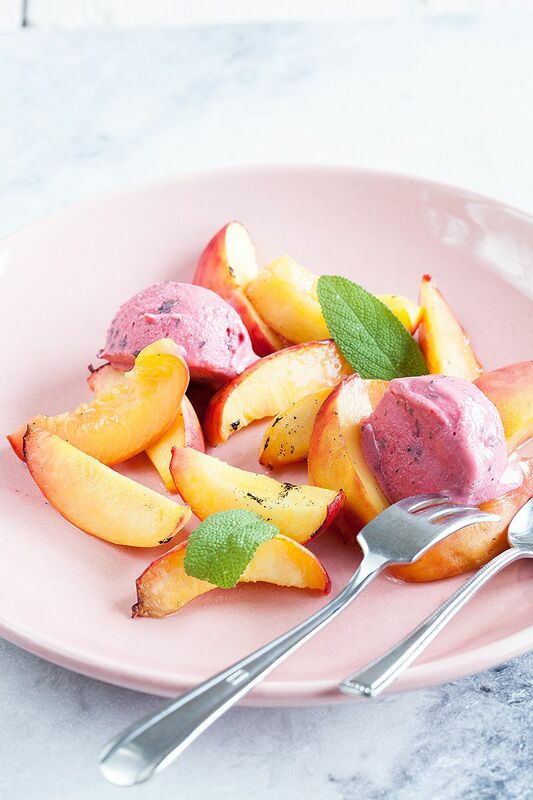 GRAB the raspberry and sage ice cream from your freezer and place 2 scoops of ice cream on each plate, don’t forget the oven-baked peaches! GARNISH the dessert with one or two sage leaves, if you like. Sidenote: if you don’t own an ice cream maker, it’s also possible to use store-bought raspberry ice cream or yogurt ice cream. 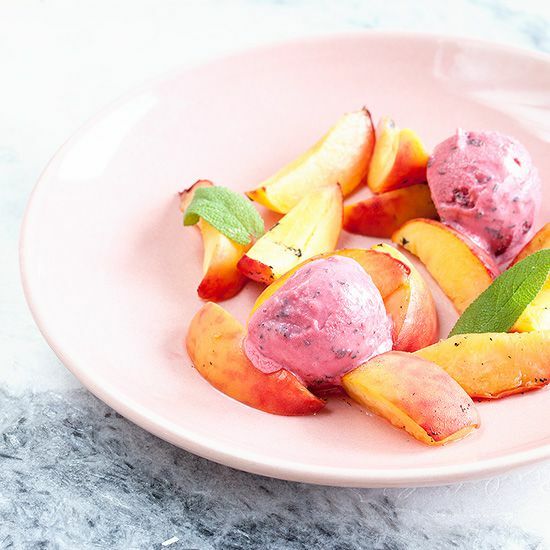 They go well with these lovely oven baked peaches! 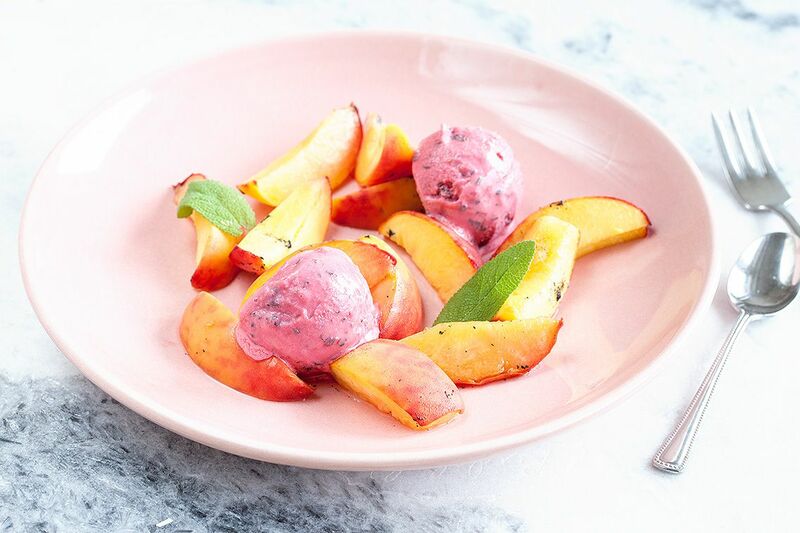 Tip: you can also wrap the peaches in tin foil and place it on the barbecue for a few minutes to create the same end result.